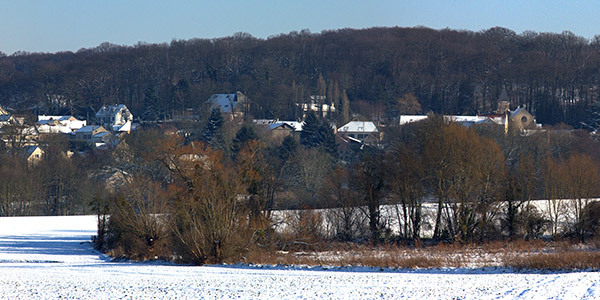 This partial panorama depicts a view of the village of Béthemont-La-Forêt under snow. January 17, 2013. Lens EF24-105 f/4 L at 105mm (168mm), handheld. This panorama is stitched from 27 images – 9 distinct images bracketed at -3, 0 and +3EV using Hugin and KRPano. The original panorama is 32717×3120 pixels (102MP).